In my October 26th blog, What We Want, How to Get It, I brought forth the idea that one of the primary reasons we model is to re-create an emotional connection in miniature. To be transported in such a way that meaningful emotions are triggered. To this end, the more realistic we can make our modeling the more effective we will be in transporting ourselves to where we want to go. As with all things, some elements contribute more than others. That being the case, it makes sense to focus initially on those areas that are most crucial and create the most impact. Start with the big ticket items and then tick other items off the list in order as time permits. 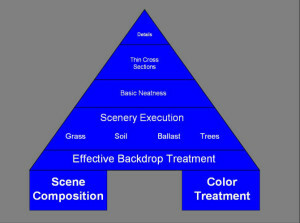 The foundation of realism is built upon effective scene composition and color treatment. If you miss the ball with either of these two elements, you’ve created a hole you can’t dig yourself out of. No degree of modeling skill will compensate for ineffective scene composition or color treatment. To be blunt, you’re screwed. For whatever reason, high levels of detail are often associated with realism. Detailing is a relaxing. It’s rewarding. Although it does make a difference, the impact is far less than other areas. 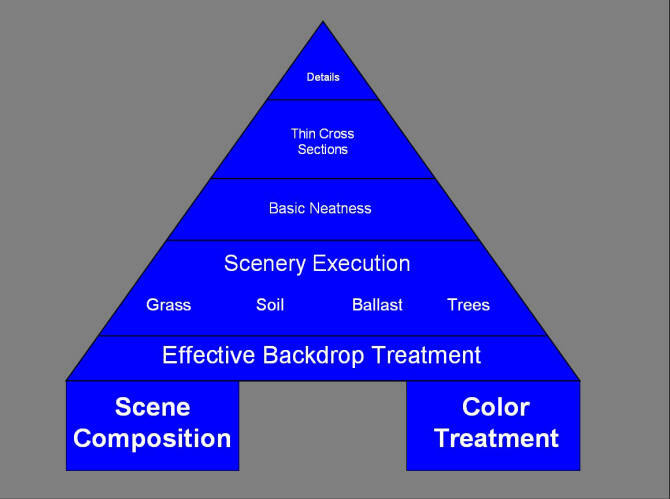 Scene Composition: Scene composition relates to the elements we choose to put in a scene, their relative size/shape/proportions, and of critical importance the space between them. The number one modeling error is placing elements too close together. Some masters of scene composition are: David Barrow, Mike Confalone, Paul Dolkos, Tom Johnson, and Jim Six to name a few. Color Treatment: Color treatment address color selection, color placement, color patterns, edging of color patterns, washes, and the effective use of black and dark brown. The best teachers of this subject can be found on the Rustbucket forum. Effective Backdrop Treatment: Backdrops take up an enormous amount of surface area. In addition, they are oriented perpendicular to the eye. For these reasons, any missteps will be glaring. A distinction should be made between “effective” handling and “artistic” handling. This is a subject area best approached from the outset with the philosophy of do no harm. Unless you are an artistic master, keep it simple and subdued. A pale blue, cloudless sky with a one or two inch simple gray horizon line is often adequate. Scenery: Volumes could, and have, been written on the subject. Some things to try include static grass, natural soil and ballast products, and the higher end grass/scrub products available from Scenic Express. Be aware of oddly shaped tree armatures or armatures with overly thick branch ends. Keep it neat. Basic Neatness: Keeping things neat, tidy, and vertical costs nothing and pays big dividends in terms of appearance. 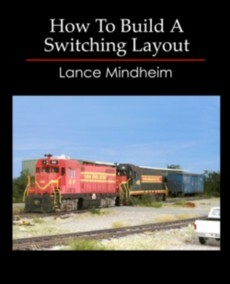 Keep your ballast neat and off the sides of the rails. Keep your trees and poles vertical. Make sure your structures are cleanly seated in the scenery. 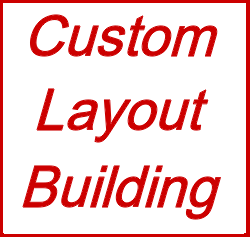 Cross Sections: This refers to the with and radii of elements such as window frames, rails, and poles. Due to limitations in the casting process these elements are often overly thick. If you can’t replace the part, at least paint it a dark color. If you can replace the part err on the side of too thin vs. too thick. A few excellent manufactures of parts with fine scale cross sections are: Tichy, Grandt Line, and BLMA.